Learn how to grow Barbados cherry, barbados cherry care is easy. “Acerola” is its common name, it is a big, bushy shrub or small tree that can grow as tall and as wide as 20 feet. Its fruits look like cherries with their bright red skin. You can use the fruits to make juices, jams and toppings for desserts. 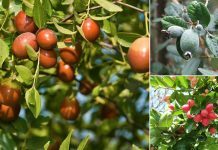 Young acerola trees are not frost tolerant and can’t survive freezing temperature, although mature trees can survive brief drops in temperature to about 28 degrees Fahrenheit (-2 C). Barbados cherry can be propagated from seeds, cutting, air layering and grafting. Barbados cherry seeds have low germination rate. 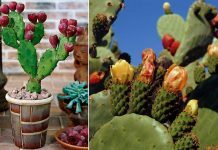 If propagating from seeds, use seeds from fully developed and ripe fruit and before using clean and dry it completely. Seedlings should be transferred from germination tray to their individual containers or in ground when they are about 2 to 3 in. tall. Plant at same depth as it is grown previously and twice as wide. If planting more than one plant, space them at least 15 feet apart. To plant, remove the plant from pot and gently knock out some soil around the roots. Place it in the planting hole and carefully spread the roots out. Fill the planting hole with soil and hand-tamp it gently. Water deeply to settle the soil around roots. The location should be sunny, weed free and less windy. 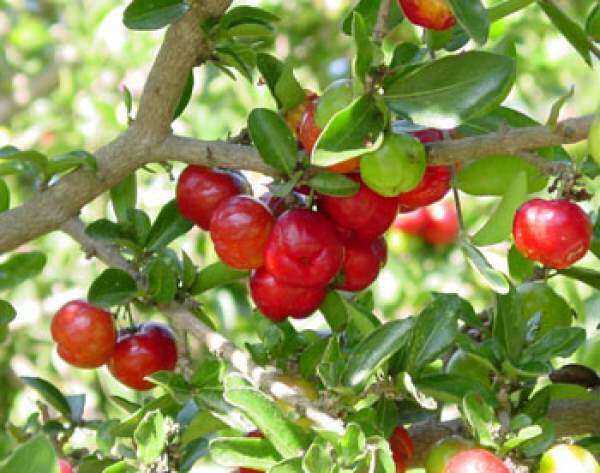 Exposure to full sun is essential for growing acerola cherry plant. Clean the soil, dig out weeds and debris. Amend the soil with the addition of a compost and lots of organic matter. Barbados cherry tree prefers slightly acidic to neutral soil. 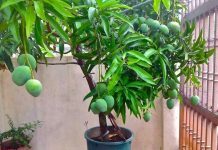 Young plant should be watered regularly, once matured it doesn’t require much watering except in drought periods and at the time when tree is setting fruit. Apply citrus fertilizer, once you start to see growth. Follow the manufacturer’s directions with regard to the amount and timing of applying the fertilizer. Spread a layer of 2 inches of mulch in a diameter of 3 feet around the tree. Straw, grass clippings or bark can be used to help retain moisture and keep the roots cooler in the summer heat. Keep the mulch at least 3 inches away from the trunk of the tree so that it does not hold up against the soft wood and inflict rot. Prune the tree in fall, after the harvest to give it a desired shape. You can cut dead, damaged or diseased branches off at any time. Harvest Barbados cherries when they are ripe and turn red in color. Harvesting is best carried out early in the morning. The most serious disease of Barbados cherry is root-knot nematode. It can also be attacked by leaf spot, brown rot and powdery mildew. Pests that might attack it are aphids, scales, borers and whiteflies. I just bought a Barbados Cherry Bush in a 2 Gallon pot an planted it in a larger pot an added root stimulate when I transplanted to larger pot. When should I fertilize it with a 8-3-9 Citrus Fertilizer. Something is eating my cherry trees leaves looks like Caterpillar…. what can i do to prevent this…..in an all natural way?